* This post was originally published on 14/05/2013 but I really wanted to share it with you all again as it's been pretty popular recently! I hope you find it useful. "How do you make money blogging"? This is a question I get asked a lot - if not every day. It doesn't just happen over night, once you have been blogging for a while you will soon realise there is a lot of hard work and commitment that goes into running a blog. You may start to wonder, could you make money from your blog? If you are really passionate enough about blogging you can even make a career out of it. Many Mums like myself are making money from their blog in their pyjamas whilst looking after their children and taking care of the housework from the comfort of their very own home. Yes, you won't be making £1000 a month to begin with but give it time and you may be able to gain a steady income or a bit of extra money on the side. Just remember it doesn't happen overnight. 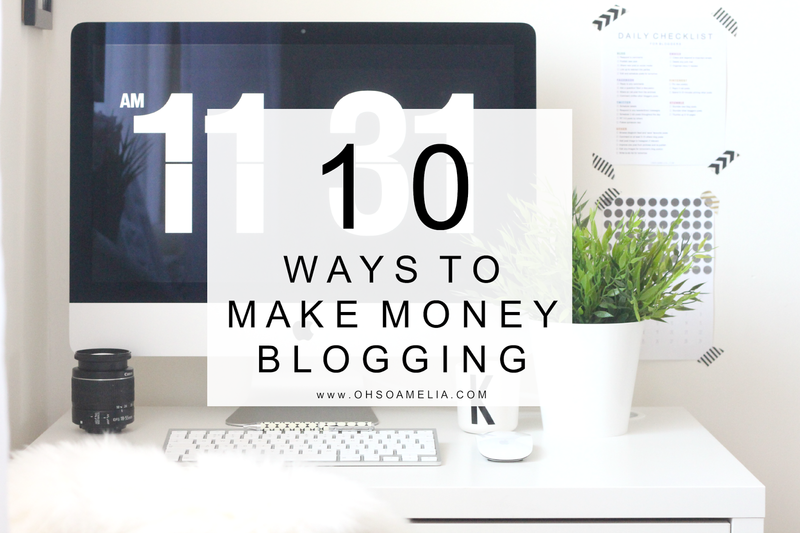 Here are 10 ways that many bloggers including myself make money from your blog and you can too! 1. Advertisements - Companies nowadays approach bloggers to promote their brands on blogs as we are a wide community and love sharing stuff we like! They trust us. Many companies are willing to pay bloggers for sidebar or top banner advertisements. Some pay monthly and some may even pay an up front fee. You will have to carry out the advertisement for the duration of the agreement. But it's an easy way to make money. Do try to keep this relevant to your blog if you're a food blog nobody is really going to be interested in seeing advertisements for stationary or kids toys. 2. Private Sponsor Ads - These are different than company advertisements as it is usually between bloggers. You may have heard of passion fruit ads, if not jump on the bandwagon and sign up! Although I don't use this and only used it when I first started blogging back in 2012 I did make a fair amount of money from it. Upload a sponsor page to your blog and start promoting that you accepting sponsors on your blog and would like to promote some new blogs. To begin with you may only be making £20 a week but in the long run it can be very awarding! I only made about £800 from it in the year that I did use it but other bloggers have been known to be on £1000's. Depending on how big/influential your blog is you can charge more for advertising spaces. 3. Sponsored Posts - Another fantastic way to earn money blogging. It's like getting a days wage to sit down and write about something you love! A PR will approach you to promote their client on your blog via a written article. Sometimes these can be already pre-written however I much prefer to write these myself as I like to ensure they fit with my blog and my tone of voice. I have done many sponsored posts over the past three years, I didn't get these straight away but as my blog has grown I have noticed an increase in PR approaches. These posts will include 1 or 2 links in to the clients website. There are may rules and regulations for sponsored posts so do be sure to read up about those before you accept any. For example follow & no follow links. Sponsored posts vary in price depending on your social media and blog presence. On average you may receive anything between £50-£500 for a sponsored post. There's never really a correct amount, it all depends on your blog really but do always go in higher when quoting a fee after all it is your time and hard work that they're paying for. A few companies where you can get sponsored posts from include IZEA, Nuffnang. 4. Paid Links - Again pretty much like sponsored posts a company will pay you to include a link on your blog. However these links may be on the sidebar instead of in a post or in an old post. A PR may pay you for example £100 to include such a such link to "Baby Girl Clothes" which will then lead back to their clients website. Depending on your page rank and blog statistics the price for these will vary. 5. Google Adsense - This is a great way to make a small income from your blog. You place Adsense promotions in your sidebar and the more readers that click on these means the more money you make. Again this depends on how much traffic you have coming into your blog as it's pay per click. To begin with you may only make £10-20 a month. Some bloggers make £100. The only downside is you have to meet the £60 threshold before you can take your earnings. Just about any blog can sign up with Adsense, don't worry it may be months before you even notice any money coming in. I now meet the threshold each month which is a nice little money earner especially as you don't need to do anything with it once it's installed. 6. Become a Virtual Assistant - Many bloggers are becoming virtual assistants. You know the ropes, especially if you have been blogging for a few years. You can provide newer bloggers with the assistance and knowledge they need to making their blog a success. This may include, organising their emails, giveaways, sponsorships, blog hops, manage their twitter, Facebook and Pinterest. If you have a lot of spare time you could be an assistant for many bloggers at a time. You may need to skype too. You can charge various amounts for different services. Some virtual assistants make £50+ an hour where some make £100 for doing a days work it all depends on what you have to offer and what the client/blogger needs from you. 7. Graphic/blog design - Do you have an eye for design? Have you been making blog layouts and had other bloggers wanting you to create one for them? Many bloggers are now turning to designing and creating blog designs for other blogger and charging a fee. Many make an enormous amount of profit from this selling a full blog layout for anywhere around £100-200! There's money to be made there! 8. Write an E-book - Share your knowledge with others. Do you blog about crafts, recipes, financial advice, blogging advice? The list is endless. What ever you may be good at a lot of others will want to know. Writing and selling an E-book with your advice and knowledge is a great little money earner. You could charge £5 a sale or even £100! It entirely depends on how popular your skill is. Some photographers sell their E-books for £200+!! A fantastic E-book I have bought is the Six Sisters Stuff Blogging Guide. 9. Freelance writing/editing - Do you enjoy writing? Well of course you do, you started a blog... but do you enjoy writing about a topic of interest. Some bloggers go onto bigger and better things such as writing for a column in a newspaper/magazine or even a well know website. There are many opportunities out there for blogger and wanna be writers. You can make a lot of money from that. Start by guest posting on other blogs first, get people interested in what you have to say and you never know where it may take you! 10. Affiliates - Various online stores have affiliate programs such as Amazon, Shabby Apple, Castegram, etc. There are hundreds of brand who now offer them. These are great ways to make money from your blog. You sign up and make money from the commission if someone click on the ad and makes a purchase on the website. I haven't really benefited from this as I only signed up to Amazon but many bloggers do make a bit of money from Affiliates. *I do realise not everyone intends to make money from their blog, this post was written to share my knowledge and experiences with my readers who have asked on numerous occasions for ideas on how to make money from their blogs. Please note I did not start this blog to make money, I am just very fortunate enough that I am now able to. If you aren't wanting to make money from your blog, that is great! Keep doing what you are doing great at. Do you have any advice for others wanting to make some money from blogging? Hi, I'm a new follower :) And I already love your blog! This is very helpful for me as a new blogger! Thanks for the fab post. I too didn't realise that money could be made from blogging until nearly a year into writing mine. Just found what i was looking for.. Thanks a million for the great articles! Do you have any advice for a new writer/blogger-- what are the best sites i should start with? Useful and informative content for the blog owners who are trying their fortune to become popular in Search engines...However thanks for the discuss. Blogging is the way to explore yourself and teach others how to do something. I think when people get positive result from your blog money will come to you automatically. I would strongly suggest that you enhance items that are useful. At the same time, I also motivate binary matrix pro to help your brings and cure them like they are your own clients. If you intend to start your own home based business you need to begin cautiously, unless you want to rush through and get trapped in get rich programs. This is great post and earn money from online is easy but you need to know the right way to go. What a great post - there are so many pro bloggers making a living so this looks like a good place to start! Great tips! I'd love to make more money from blogging it's hard sometimes to decided what opportunities are good and which will drain money. I love making money from home with my blog - I have been able to be around for both my children's childhoods and also bringing in some fun opportunities like days out to review and holidays! Some useful tips and ideas. I should probably do more in the ads and affliates lines. Fab tips. People might find that an Ad network increasing income more than just adsense, but every penny ads up. Good tips here and some I hadn't thought of as well. These are all great tips - thank you for sharing your knowledge and experience. I have a post like this, I should share it every time I get asked how it all works. Getting my head round ads has been on my list for ages, thanks! Great tips!! I wish I'd had this when I was starting out...it's still useful now even though I almost feel like I know what I'm doing!! I love your post! So much good info for bloggers of all levels. I’m currently in the content development stage so these tips will definitely help me in the future. Thank You for the tips Kerry! God Bless. Lots of really great tips here, Kerry. Thank you for sharing them. I would like to make more money from my blog and I am sure this will help. Nice ways to be a millionaire. Finally will get that much only how much is decided for us that is alos on decided time. Nice article specially for beginners who want to make money through blogging rather than 9-5 job.Thanks for sharing with us and keep sharing your experience with the readers. I stumbled upon your article from Pinterest. I only started my blog a few months ago with my twin sister. I found the ideas useful and I like the layout of your blog too! Good luck and keep on keeping on! *_>>>Be very careful about anyone promising you easy money with binary options.